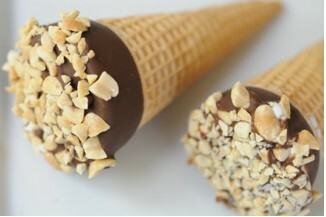 Homemade Ice Cream Drumsticks- All on your own! 1. Take the cardboard egg carton and place upside down, so the mounds are facing up. Pop the bottom of the empty sugar cones through each mound. This will be your assembly base. 3. Place in freezer for 10 minutes. While waiting; take the ice cream out of the freezer to soften. 4. Take cones out of freezer. Wrap each cone in wax paper and cut tops to about 2” above the edge of the cone. 5. Fill the cones with the softened ice cream to within ½” of the wax paper. Return to freezer for 15 min or until frozen. 6. Once the ice cream has firmed, take out of freezer. Pour Magic Shell into a bowl for dipping. Gather the kids, and let each of them dip the top of their drum stick into the Magic Shell till the ice cream is covered. Then sprinkle on the desired toppings.